Drawing on the recent ‘celebrity’ appearances of the former White House press secretary Sean Spicer, Chris Newman the director at Civic Reputation says taking responsibility and accepting the event which caused the crisis is imperative to beginning the rebrand process. Then there’s recovery, which is to “take opportunities to build awareness of your rehabilitated personal brand,” Newman adds. But was Spicer’s appearance successfully accepting the event which caused the crisis, or was it simply another spanner in the works? After resigning as the White House press secretary in July, Spicer has begun to rebuild his own brand and public profile as a celebrity, independent of US President Donald Trump. 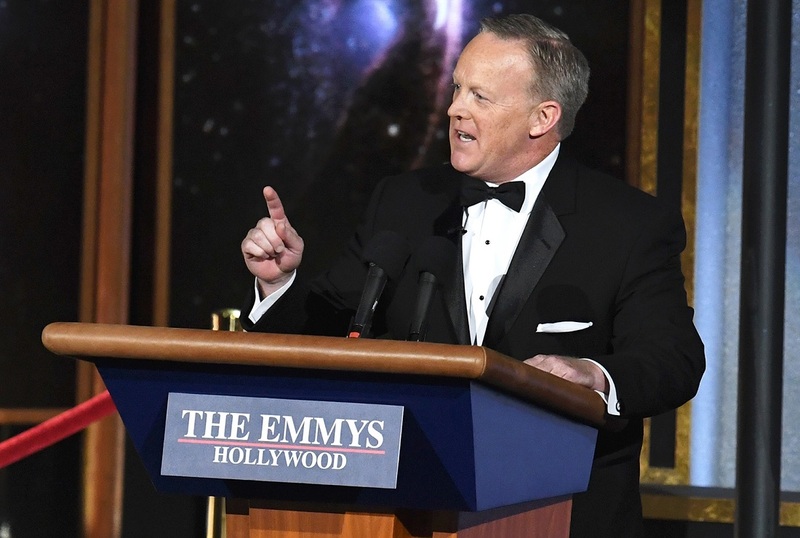 In a bid to try and repair his brand, Spicer recently made headlines with a surprise cameo appearance at the Emmy Awards, in which he mocked his own defence of Trump’s inauguration attendance. Within minutes of his brief skit, journalists and celebrities took to social media to share their varying opinions. Some believed Spicer did himself a favour by throwing “Trump under a bus”, but others, such as actor Zach Braff, were “not ready to laugh ‘with’ Sean Spicer”. Spicer isn’t the first celebrity who’s attempted to reinvent themselves in this way – Shane Warne, Mark Zuckerberg, Tiger Woods and Pauline Hanson have all fought to refresh their own brand with contrasting results. So how does an individual successfully create a new brand? When attempting to establish a new or refreshed personal brand, rebuilding trust is paramount, says Cannings Strategic Communications managing director, Renee Bertuch. “It takes time to build, often years, because at the core of a personal brand is trust,” Bertuch says. Robyn Sefiani, managing director at Sefiani Communications Group, agrees with Bertuch noting celebrities, politicians or professionals such as Spicer must earn back any respect they may have lost with the public in order to rebuild their brand. “If the crisis that engulfed them was of their own doing, or perceived to be so by the public, over time these individuals have to prove they are completely different to the persona of that discredited individual. “They need to get on with life and prove their mettle, while looking for an authentic cause to support or lead,” Sefiani adds. In order to change their persona and rebuild trust, individuals must remember what a personal brand is and keep this at the core of their transformation, Sefiani continues. Sefiani defines a personal brand as the “persona” put forward to the public including what you say, what you do, what you stand for and how you present yourself. “It’s something established over time, and like corporate brand and goodwill, it takes skill and commitment to rebuild a personal brand after a crisis,” says the MD of Sefiani Communications Group. Canning’s Bertuch adds to Sefiani’s definition, arguing listening, learning, accepting, correcting, evolving and having a plan of action will assist in creating a smooth rebranding process. “The rebuilding starts with frank and unfiltered feedback on how you are perceived, to discover the issue and understand current perceptions. “To establish trust, we must first be sincere in our desire to accept and correct our mistakes. “Bring your new brand to life. Develop a plan, online and offline, to create a balanced presence of yourself. Your plan will include topics you chose to speak about, groups you choose to support, the image you portray, and the associations you join,” Bertuch says. “Gratuitous philanthropy” actions after a crisis “smacks of desperation and often backfires”, Sefiani says. Civic Reputations’ Newman agrees, saying reverting to any pre-crisis behavioural patterns can backfire. “Any behaviours that could be perceived as contrary to the core principles of rebuilding a personal brand (authenticity, humility and consistency) must be avoided. “Reverting to pre-crisis behavioural patterns, including who you associate with, will have a bearing on the credibility, and ultimately success, of your efforts at rehabilitating your personal brand. Tiger Woods is another celebrity who has been on a failed mission to rebuild his brand because he was criticised for “a lack of genuine control,” Newman says. “The contrived, highly stage-managed apology in 2010 following revelations of his multiple extramarital affairs and prescription drug abuse was criticised by some for a lack of genuine contrition. “Unfortunately, substance abuse issues continued to plague Tiger and he was arrested for driving under the influence earlier this year. Any attempts at a recovery of his personal brand will remain stunted until he can get on top of his addiction issues,” he adds. Mark Zuckerberg’s reputation was diminished after the movie ‘Social Network’ hit screens across the world, depicting him as a ruthless entrepreneur. The film resulted in two lawsuits being filed against him, one from a friend of his. According to Sefiani, Zuckerberg has done a successful job of rebuilding his reputation as a ‘family man’ and building an empire, Facebook. “He has crafted a “family man image” regularly posting on Facebook pictures of his wife, daughters and very cute dog Beast, which has its own Facebook page. “Mark and Priscilla Zuckerberg’s announcement late last year that they would sell around $13bn Facebook shares to fund philanthropic projects justifiably made glowing world headlines and Mark is increasingly appearing in political settings,” Sefiani says. The managing director of Sefiani Communications Group speculates the Facebook founder could be on his way to making a move to the White House, saying “his personal brand would seem to support such an ambition if so”. Newman points to Australian cricketer Shan Warne as an example of someone who’s made a solid impression throughout times of rebranding. “Shane Warne has bounced from personal crisis to personal crisis and yet remains extremely popular – there is no denying he has a Teflon quality about him. “The key for ‘Warnie’ is his consistency. It goes beyond being a ‘larrikin’ – he doesn’t pretend to be anything he is not and in general he is quick to apologise when he gets it wrong,” he says.